Much like the first gen counterparts, the 2500X is a quad core processor with simultaneous multi-threading while the 2300X is a straight forward quad core. The X processors usually have a higher thermal design power (TDP) than hypothetical non-X equivalents, allowing them to take advantage of AMDs Extreme Frequency Range technology for higher turbos for longer given sufficient cooling, although these are set at 65W, similar to non-X processors. Normally X processors come with better stock coolers at retail, however as these are OEM only processors, it is up to the system integrator to provide sufficient cooling. Both of these processors use AMD's Zen+ microarchitecture, built on GlobalFoundries' 12nm manufacturing process node. This means it has better voltage, frequency, and power characteristics over the first generation Ryzen, allowing them to run faster at the same power, or cooler at the same performance. AMD has also applied minor tweaks to the design, which gives the processor an additional 3% performance at the same frequency to first generation Ryzen. We tested and verified these claims in our review of AMD's first Zen+ processors. If you believe the sales numbers posted by German retailer MindFactory , or the bestselling lists over at Amazon, it would be hard not to notice that out of the first generation of Ryzen processors, the Ryzen 5 1600 has been one of the top best sellers. At an initial release price of $219, followed by subsequent cuts, it hit an aggressive price point and offered six high performance cores with simultaneous multi-threading where Intel could only offer four cores without hyperthreading. It also allowed for overclocking, providing users with the potential to squeeze more out of the processor if they had the cooling to do so. Pair this CPU with a good mid-priced motherboard and the bundled cooler and it is easy to see why this CPU had been successful. 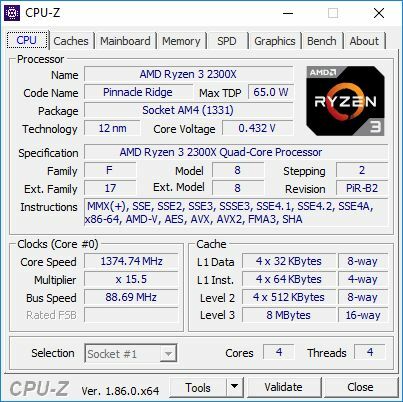 For the second generation of Ryzen, AMD launched four CPUs at retail: the 2700X, 2700, 2600X, and the 2600, which we reviewed at launch ( click here for the review ). Technically we have a direct replacement to the 1600 in the 2600, which at $199, is very competitive. However, in contrast to the first generation of CPU-only products, AMD never did fill up the rest of the processor stack with CPU-only options. Under the 2600, AMD recommends the 2400G, a quad core with simultaneous multi-threading and integrated graphics at $169, then the 2200G at $99 which is another quad core with integrated graphics but without hyperthreading. AMD used to have four processors in this space (1500X, 1400, 1300X, 1200) which were also very competitive. We tested them all when they were launched against the competition, and the parts had obvious strengths and weaknesses. Despite AMD recommending these parts with integrated graphics up to $165 (current Amazon pricing), it would appear that their system builder partners have requested a CPU only option below this price point. This is where the Ryzen 5 2500X and Ryzen 3 2300X come in. These parts are generational updates against the 1500X and 1300X, but at present only available to AMD’s partners that build full systems. These parts cannot be ‘officially’ purchased at retail; however it is likely that some will filter out onto the grey or second hand markets. The main obvious reason for not releasing several parts at similar price points is to cannibalize each other’s sales – by offering the 2500X and 2300X as OEM-only parts, it allows AMD to maintain a rigid stock based on order requirements, while the 2400G/2200G can be sold on the open market. There could be the argument from the side of PR that at this price bracket, $150 and below, emerging markets benefit most from integrated graphics solutions. But that doesn’t preclude selling these parts at retail elsewhere in the world. Regardless of the reasons, we still wanted to test these CPUs to see where they stand, and ultimately if the sub-$150 plus discrete GPU self-builder would benefit from a CPU-only option. Normally when we compare processors, we compare on two fronts: core/thread count, and price. Very rarely do our review processor(s) have the same contestant for both. In this case, we don't have a list price for the 2300X or 2500X, which makes this a little difficult. In order to be competitive however, we would expect the two CPUs to fit price wise where their naming suggests - above the 2200G and 2400G respectively. When it comes to competitive Intel processors then, on price, the competition is around the Core i3-8100 at $120, or the Core i3-8350K, currently on sale for ~$190. These parts is a quad core without hyperthreading, which automatically puts it on par more with the Ryzen 3 2300X. Intel no longer offers anything below an 8-core with hyperthreading, which makes a comparison with the Ryzen 5 2500X difficult. In terms of thread parity, then either the quad-core Core i3-8100/i3-8350K with four threads is still relevant, or the six core i5-9600K with six threads comes into play, although it is worth bearing in mind that this is a $260 processor. Going for eight threads on Intel for comparison just blows out the budget, making a comparison more irrelevant. If AMD ever decides to release these processors at retail with corresponding stock coolers, on paper at least, they appear to be very competitive. This is one reason why we are testing these parts in a review.